Instead of Bring Your Own Device, today we tried Bring Your Own Sphero. In the past, when we've completed lessons with Sphero, it has taken us about a week to rotate through all the groups. For today's lesson on a Mean, Median, and Mode, I had a few students volunteer to bring in their Sphero from home (they were a popular Christmas gift this year). Although we ended up with larger group sizes of 5-6 students per group instead of our usual 2-3, we were able to have everyone working at once and finish in a class period instead of spreading it out over a week. Each group chose the number of targets and the distance from start to target. As you can see, these variables varied greatly. Using a speed of 10%, students needed to determine which delay would get them to the target. As always during Sphero lessons, math, reading, coding, problem solving, and cooperation were needed. We ended our lesson today by comparing our variables and successes. Tomorrow we'll decide on a common unit of measurement and find the mean, median, and mode. And chances are, the students will debate, calculate, struggle, and learn. This week was #MACUL Inspired. The kids new all about the MACUL Conference. They saw the presentation and many of the parents follow us on Facebook. It was only natural for the kids to start asking questions about new technology. I was so glad we were ready for them. My response... you'll learn a lot if you are here first thing in the mornings! 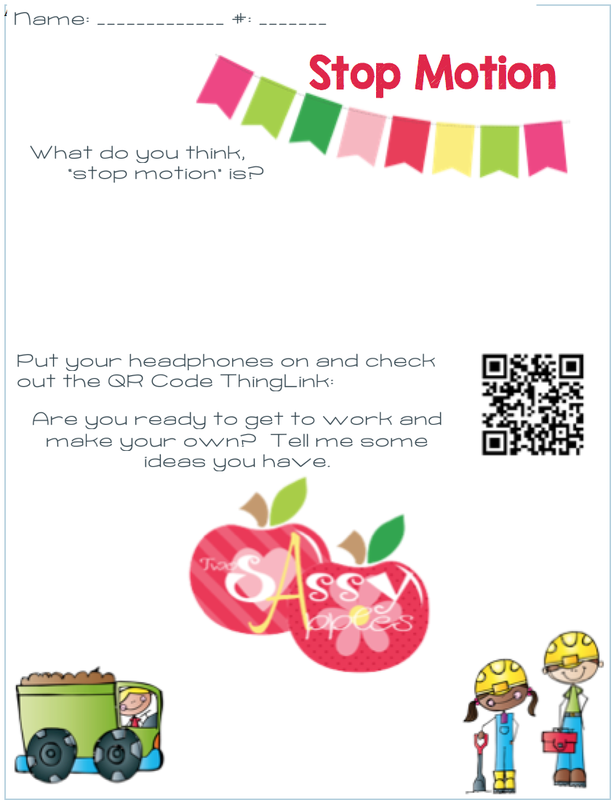 Sorry... had to blur out the QR Code as it goes to a class Thinglink. 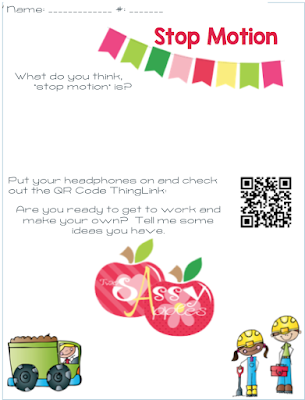 The QR Code is a Thinglink that has several informational videos about Stop Motion and gives them the app to download. Wednesday's Sheet will be more about Makey Makey. Kids are already familiar with Makey Makey and it's general set up. Today's sheet will introduce computer programming with the program Scratch. Students will be exposed to sample videos (using Thinglink) that inspire them to think differently than before. 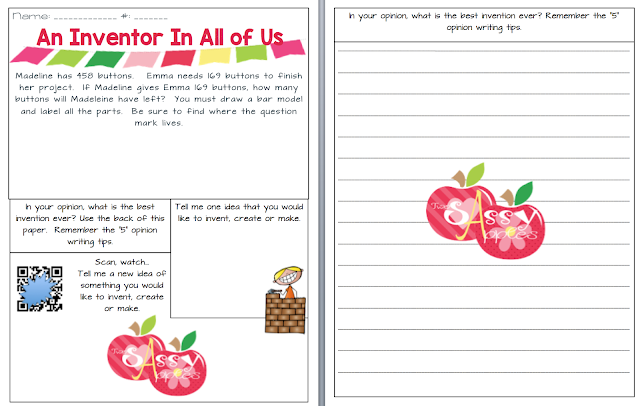 We are working on opinion writing and bar modeling, so there are components of those. Once again... Thank you to Makey Makey and Thinglink for product donations at #MACUL16! This summer, my family stumbled upon “Race to Escape”, on the Discovery channel. We loved watching teams work together to solve clues to breakout of a room before time ran out. I was so excited when I saw a tweet about BreakoutEDU a few months ago. After a bit of research, I knew I needed to incorporate Breakouts into my class. The purpose of a breakout is for students to work together to solve clue, unlock locks, and breakout (break into) a box. Boxes can contain prizes, candy, or even just a congratulatory note. I had Smarties in the boxes today and a student said he was hoping for just a few minutes of extra recess. Today my class completed their fourth Breakout. This one was created by another BreakoutEDU teacher and was a review of nouns, verbs, adjectives, and adverbs. Since I have a bit of experience now, the setup took about an hour last night. After preparing the room and the locks, I walked through the session and made sure everything was in place. This is a very important step! Last night I realized I forgot to hide one of the clues. 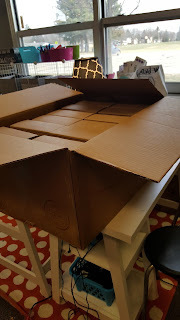 When my students arrived in the room after lunch and saw the boxes, they were ready for action. I broke my class into three random groups, gave them each a box, and set the timer for 45 minutes. These students continue to amaze me with their problem solving abilities. They’ve learned to look at a problem through a variety of lenses. If something doesn’t work, they go back to the clue and try again. We’ve also learned through this process that sometimes it is difficult to think outside the box. Sometimes teams are sure they are on the right track and struggle to look at a clue another way. Breakouts have a tendency to sneak outside our classroom, and today students needed to find a locker for their next clue. For the first time, we used official hint cards. The students voted to not have a penalty attached to the cards. They did need to wait at least 15 minutes before using one, and the group had to unanimously agree to using a hint. Although the focus of this breakout was on grammar, like most breakouts, this one incorporated other skills, like coordinate graphing. This was our first time using red decoder glasses and the students were in awe. By the way, a black light makes clues that much cooler! Although no group was able to Breakout in 45 minutes, they had a lot of fun trying. During our reflections, students said this was the hardest and most challenging Breakout yet. They also said it was the best! It was also determined that it would be too difficult for the third grade class that plans on using it next week. Therefore, tomorrow my students will tweak the clues to make them more age appropriate. For more information on BreakoutEDU, visit their website http://www.breakoutedu.com/ or join their Facebook page https://www.facebook.com/groups/breakoutedu/. How had I not heard of the Two Sassy Apples before Thursday night? 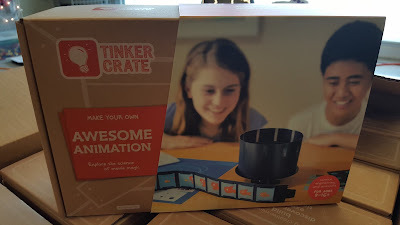 I thought I was going to a workshop to learn about Coding and Tinkering in the classroom and instead I came away with so much more. Tosha Miller and Julie Leach shared pictures and videos from their 2nd grade class and happened to mention that they often have visitors observe their classes. I took this as an invitation, and arrived at their school bright and early the next morning. I so was excited to see Mrs. Leach and Mrs. Miller in action, but soon realized that wouldn't happen. Instead, I witnessed a group of over fifty 2nd graders in action. Imagine my excitement when I walked into math class and observed student projecting their work on the Promethean from their tablet. Then, the students started working in Marker Spaces. Some students were creating circuits with Little Bits, programming with Dot and Dash and creating music with a bit of play dough and Makey Makey. Games were being developed with Pixel Press, and numbers were manipulated on the Promethean table. But it wasn't all electronics based. 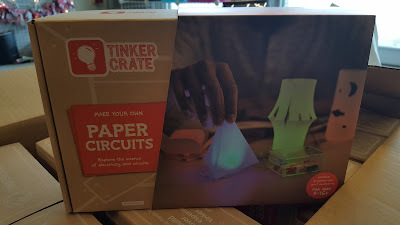 These students were reading directions to put together a Phantom Projector from a Tinker Crate. And this group started a paper mache alien. I love that they grabbed a tablet to find pictures to work from. Every group I joined welcomed me and included me. They gently guided my learning and explained what they had learned so far or where they were heading with their projects. Students were creating and reading. They were incorporating math, music, coding, and spatial reasoning. Every student was engaged and learning at their own pace. What an amazing 2nd grade classroom! Nearpod in Grade 2... Free Nearpod Subscription for Hopefully YOU! We love using Nearpod and so do our students. Students of all ages learn best when they are interested and in control of their own learning. Nearpod helps us be successful in both of those areas. Math- We run Nearpod as "Homework" sessions. 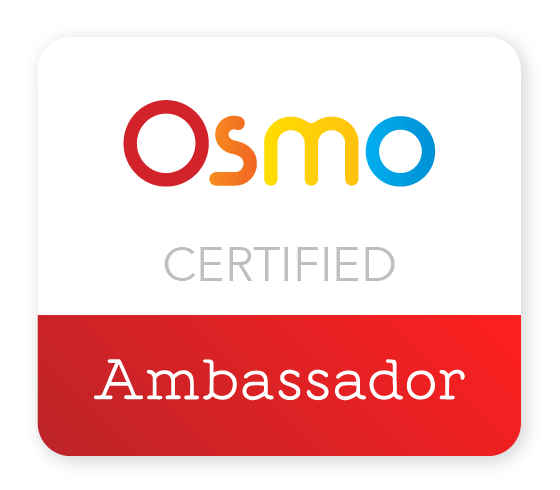 This allows student to access the Nearpod assignment at home... at school... whenever... where ever. Students scan the QR code and it takes them right to the Nearpod session. Once students submit their work, we (teachers) can assess their work. Writing- Students have access to writing resources when ever they need it. This sheet gave students sentences starters, their planning sheet, and access to our Nearpod Opinion Writing lesson. This is posted on our resource board for students to access whenever they need. Thanks to Nearpod... you have the chance to win a Gold Subscription! Look at all these Tinker Crates to be given away this Thursday! 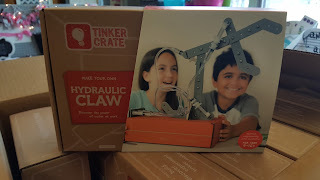 Thank you Tinker Crate!!! Do you want one? Come to our session!